Buxton is on the edge of the Peak District National Park, the first National Park to be designated in Britain. It lies between the cities of Manchester, Sheffield, Derby. Buxton - Travel by coach - If you'd like to speak to someone about your journey you can ring Traveline on 0871 200 22 33. Buxton - Travel by road - Buxton is on the A 6. A nearby large town is Macclesfield. Buxton is about 25 miles from MANCHESTER. Buxton is 10 miles west of Bakewell, 10 miles east of Macclesfield and 15 miles SE of Stockport. Buxton - Travel by train - Buxton Station, Station Road, Buxton, Derbyshire, SK17 6AQ. Ticket office. Waiting room. Pay phone. Toilets. Whole station step free access. Manchester to Buxton service. Buxton - Sport - Buxton & High Peak Golf Club, Townend, Waterswallows Road, Buxton, Derbyshire, SK17 7EN. Tel: 01298 26263. Buxton - Sport - Buxton swimming pool. Tel: 01298 26548. Buxton - Sport - Buxton F.C, Silverlands, Buxton. Tel. 01298 24733. Buxton - Shopping - Buxton offers a wide range of shops in the Spring Gardens Shopping Centre, the High Street and the Cavendish Arcade. Markets are held every Tuesday and Saturday. Marks & Spencer, 47 Spring Gardens, Buxton, Derbyshire, SK17 6BJ. Tel: 01298 79311. Woolworths - 44-46 Spring Gardens, Buxton, SK17 6DB. Tel: 01298 22586. Boots The Chemists, Buxton. Tel: 01298 23084. Royal Bank Of Scotland. Tel: 01298 79419. Buxton Post Office. Tel: 01298 23001. Buxton - Other information - Buxton Museum & Art Gallery, Terrace Road, Buxton, Derbyshire, SK17 6DA Tel: 01298 24658. Buxton Library. Tel: 01298 25331. Buxton Town Hall. Tel: 01298 28400. Chesterfield is 150 miles from London. 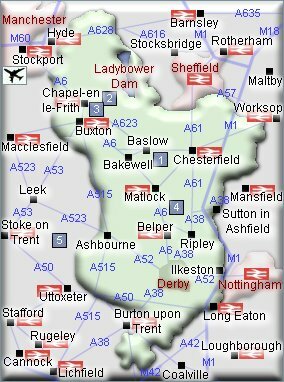 It is 45 miles from Burton on Trent to Chapel en le Frith and 24 miles from Ashbourne to Ilkeston. Airport indicated is Manchester Airport. Buxton is on the A6. Rail Stations (Not all stations shown). There is a station in Buxton. - SPEEDWELL CAVERN, Winnat's Pass, Castleton, Hope Valley, S33 8WA. Tel: 01433 620512. speedwellcavern.co.uk. For hotels accommodation in other areas nearby see Bakewell hotels Macclesfield hotels & Leek hotels. For Bed and Breakfast accommodation in other areas nearby see bed and breakfast in Macclesfield & bed and breakfast in Leek. For self catering accommodation in other areas nearby see Bakewell, Macclesfield & Leek.